Seasonal heavy rain, including falls from ex-TC Raymond, continued across the tropics. Details are in the Wettest and Downpours sections. Fresh winds and unusually large swells of up to 2.5m resulted in 190 surf rescues at Perth beaches and may have been responsible for the disappearance of a yachtsman and his wife. The couple were last seen rowing a dinghy out to their yacht off Rottnest Island late this evening and have not been seen since. A search involving 3 aircraft and 15 boats was called off on Thursday after the dinghy was found floating upside down. 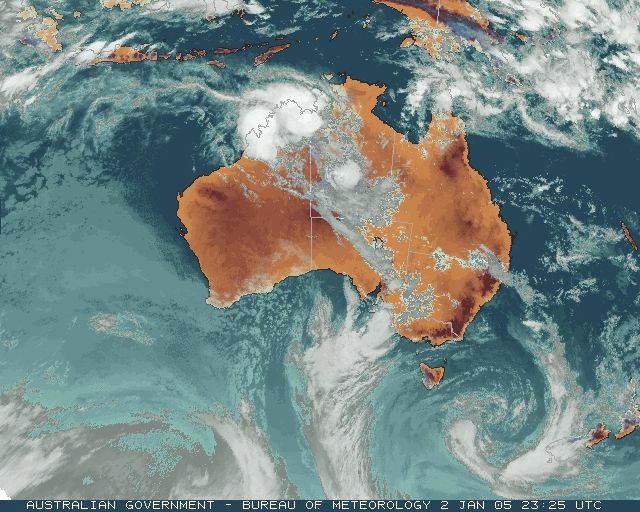 A deepening low moved southeast down the SA coast today bringing widespread thunderstorms, some severe, across the state's populated southern areas. The low pulled in warm, moist air along the eastern flank of a developing cold front, with much colder air behind. Wind gusted to 109km/h at Parafield Airport, 15km NNE of Adelaide CBD at 11.35am, with a temperature drop from 33 to 20C in 5 minutes. Other strong wind gusts in SE SA are given below. Power was cut to 23,000 properties during the storms, which moved slowly across the state's south from early morning until they moved into western VIC late afternoon. The blackouts were widely spread across the mid-north, suburban Adelaide and Adelaide Hills, and the southeast, and some 6,000 properties did not have power restored until late Tuesday or early Wednesday. Port Pirie, Port Broughton and the northern suburbs of Adelaide, especially Para Hills, received the worst storm damage, with SES responding to 38 callouts in the Para Hills area alone mostly to deal with trees blown onto properties or blocking roads. The Freeling-Kapunda Road near Kapunda was closed for six hours due to power lines coming down, the Eudunda-Kapunda Road by minor flooding and trees on the road, and the Sturt Highway at Accommodation Hill by flooding. In the wine-growing Eden Valley, 55km NE of Adelaide, a narrow path a few kilometres wide running NW to SE experienced extreme winds, rain and hail around 3.30pm. At Irvine Wines, 3000 merlot vines were severely damaged by hail, while 17 out of 19 rows had support posts torn out of the ground. A shed roof was lifted and an empty water tank blown into the middle of a vineyard. 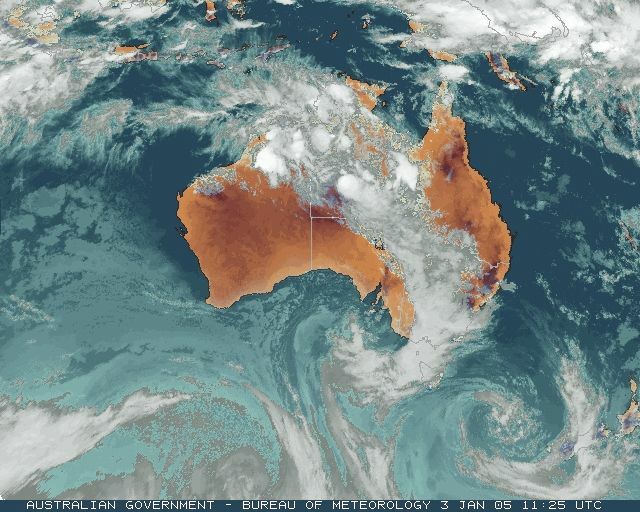 As the temperature maps show, it was a warm night followed by a hot day across much of SA, NSW and the WA Pilbara today, with the temperature hitting 46.3 at Roebourne WA and a hot 43.5 at Menindee in western NSW. 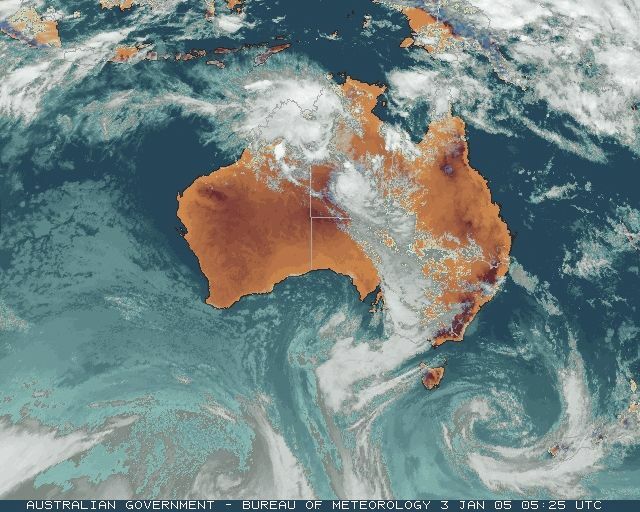 More remarkable, however, were the very low daytime temperatures recorded in Central Australia, thanks to a thick swirl of cloud from ex-TC Raymond which lodged over the area for the day. The Alice Springs top temperature was 26.9, 9.3 below average, while at Territory Grape, 140km north of the Alice, the top of 24.0 was 13.7 below. 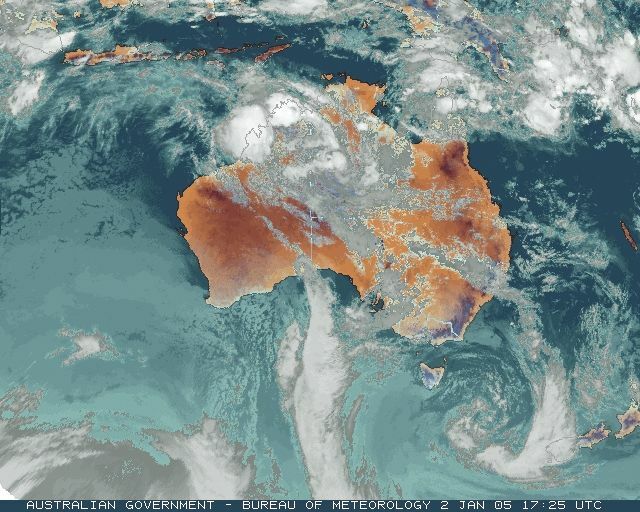 Rain from the cloudmass spread slowly south, with Ali Curung, 150km south of Tennant Creek, recording 40mm in 6 hours to 3am, and Territory Grape 44mm in 6 hours to 9pm. Lightning from storms overnight ignited three bushfires in southern WA. Two were near Manjimup, at Lake Muir Nature Reserve and Wattle Forest, and the third in the Fitzgerald River National Park, 150km NE of Albany. A bushfire was burning on a 5km front in inaccessible country on Moreton Island, NE of Brisbane, tonight. Campers along the eastern shore of the island were evacuated as a precaution. These records are as received at 1007 EST on 05/02/2006. Help in interpreting these statistics and information on quality control is here.